Despite weather forecasts of impending rain and thunderstorms, Dianne and I decided to head out to one of our favorite campgrounds in Southwestern, Oklahoma. K-River Campground on the Kiamichi River offers canoe & kayak rentals, shuttle service, cabins, tent camping and RV sites. You can find out all about the campground from the campground owner Tom Garrett's website: Kriver.com. For us, almost the entire drive is on Indian Nations turnpike, you have to pay some tolls, but it is very fast road. Take the Antlers exit off the turnpike and K-River campground is just a few miles north of Antlers on Hwy 2. See the maps on Tom's website. Spending the night in one of Kriver's cabins has become something of a March tradition with Dianne and I. Spring weather makes me anxious to get on the water and Dianne prefers to focus more of her attention on the NCAA Basketball tournament. The DishTV equipped cabins on the Kiamichi River at K-River campground provide the perfect compromise. The WiFi internet access recently added makes the offer even more attractive. Tom Garrett and his crew will outfit you and your group for paddling trips of almost any size from just a few hours to several days on the river. Water levels can change very fast on this part of the Kiamichi due to water releases from nearby Clayton Lake. Last year, we arrived to find the river nearly dry and the next more it was bank-to-bank and rolling! This weekend the water level was low, but good enough to paddle for several miles around the campground and sme folks were getting shuttled upriver to 9-Mile creek and paddling down to the camp. Going upstream we occassionally stepped out of our kayaks to wade a few yards through the low water rapids. There was enough current to take us down these same low water rapids, but the water level was too low for me to paddle up them. Although the weather was rather warm and humid, we had NO problems with either mosquitos or ticks. Strangely, we saw NO turtles or wading birds on the river. The water was quite clear and cold, and since upstream of Kriver camp is heading East and downstream is heading West there are ample opportunities for photography. I love the location of K-River campground, however their cabins are not exactly what you would normally expect. Our cabin was built from a storage building that had been converted to a retail store that had been converted to a cabin. In fact, it still has the "Basket Barn" sign on the front! Following the converted barn theme, we had lunch Saturday afternoon in Antlers at the "Burger Barn", also made from a converted storage building! The campground is run entirely by men and you can tell it from the details. 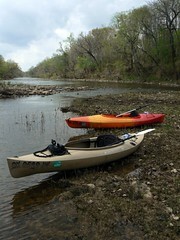 Expect expert advice on river conditions, but do not expect a mint on your pillow. Even their finest Dish TV equipped cabins are very spartan and the water smells of suphur. Bring your own dishes, linens, towels, washclothes, coffee cups, coffee, blankets, grill...basically everything. Cabins cost from $45 to $85 per night. The RV parking spots are wide and plentiful and many offer a fine river view. We were especially happy to find the WiFi internet up and easy to work with, in fact we used it to pay for our lodging via paypal minutes after arriving. The RV parking prices seem quite reasonable: 30 amp - $18 for 2 adults. $3 ea for extra adults 16 or over. Includes water and electric. $22 for 50 amp hookup. I think we may bring our toyhauler down here the next time we can get away for a week or so. There are a number of free running camp dogs that might be scary to very small children or folks unaquainted with country dogs. We didn't mind as Dianne and I have lived in the country our whole lives and we can tell the difference between country dogs and feral dogs. The biggest problem we saw? No cell phone signal. Sadly, I cannot sneak away to K-River on a Thursday and work as if I am working from home the rest of the week without cell phone signal.